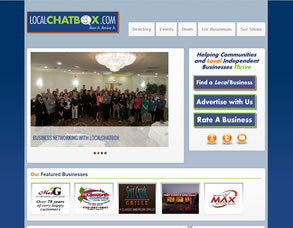 LocalChatBox.com is a virtual approach to the advertising magazine. The owner of this company came to me with the idea to create a virtual site to provide local businesses with an inexpensive way to get out to their clients. In addition she wanted the site to be completely interactive by including reviews, ratings, photo galleries, events, etc...this is the best of both worlds, where the local businesses can create almost mini web pages for their clients. Check it out! Directory Listing Individual Image Galleries for each directly listing Reviews / Ratings Featured listings, and featured ad space Ability to download .pdf files (menus, etc). Event listings for any one included in the directory Testimonial page for people to comment about LocalChatBox services Contact Us page to contact LocalChatBox Great looking layout, based off of the logo created. Website: a Dec 2014 - This company has since shut down, but see below for the sample images of the site as it looked.